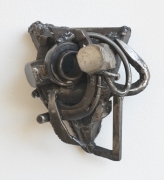 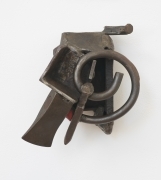 Alexander Gray Associates was pleased to present its first exhibition of Melvin Edwards’ sculpture. 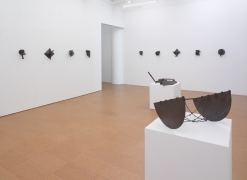 The exhibition spans four decades, including his influential series, Lynch Fragments (on going from 1964) and a selection of large-scale works from the 1960s and 1970s—all of which convey Edwards’ importance both as an American modernist and conceptualist, and the artist’s deep-rooted expressions of social justice. 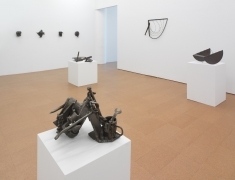 The exhibition ran concurrently with an installation of Edwards’ works in the contemporary galleries at The Museum of Modern Art, New York. 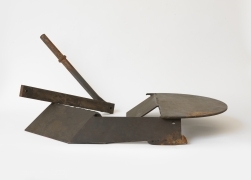 Edwards began his series, Lynch Fragments in 1963. 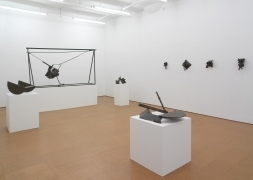 The works on exhibit from this series span three periods: the early 1960s, when he responded to racial violence in American history; in 1973, when his activism concerning the Vietnam War motivated him to return to the series; and from 1978 to the present, when he began making Lynch Fragments to honor individuals, and to explore memory and his interest in African culture. 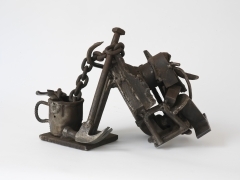 The most recent works, eight of which are included in this show, display the remarkable range of expression Edwards achieves with his method of welding found-objects into mask-like forms—including hammers, chains, and rail road spikes—and how, in the process, he renders violence, humor, and hope from these objects. 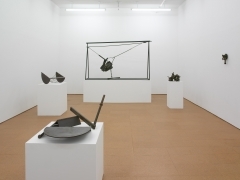 Also on view are large-scale environmental sculptures by Edwards from the 1960s and ‘70s. 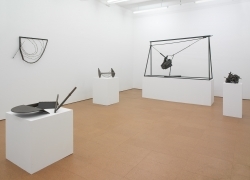 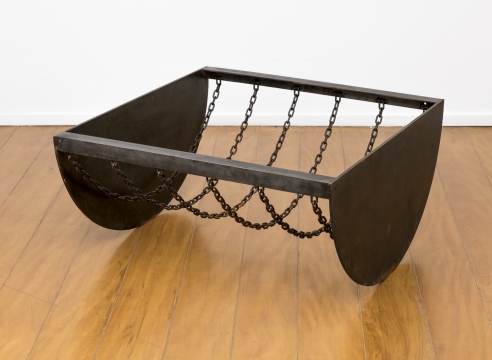 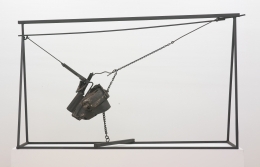 In Chaino (1964), Machete for Gregory (1974), and Five to the Bar (1973), Edwards welds barbed wire, car parts, and chains to create sculptures that investigate volume, weight, and interactivity. 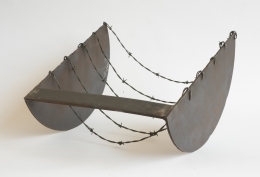 Edwards’ interest in modernists like David Smith and Julio Gonález is apparent in Chaino, but the precariousness with which he has suspended a car bumper evokes menace, as does his use of barbed wire in Five to the Bar. 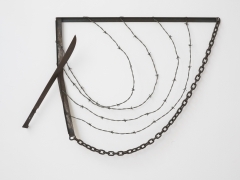 In all of these works, Edwards marries the toughness of barbed wire and steel with a refined approach to drawing and architectural space. 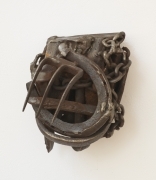 He also continues to investigate African-American experience—both as history and biography—through the material and formal qualities of these sculptures, and the inherent metaphors of their sources.